1. Gather your supplies and let’s get started. 2. On pink cardstock trimmed to 4 x 5.50 inches, place your stencil and start adding Creative Medium Pink with a palette knife. Let dry. 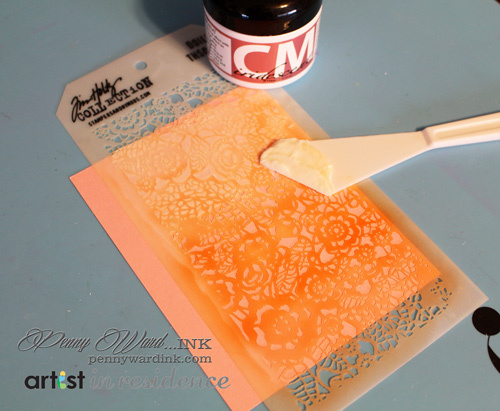 TIP: I spray the back of my stencil with EasyTack as it holds down the stencil to the cardstock and the craft mat. 3. 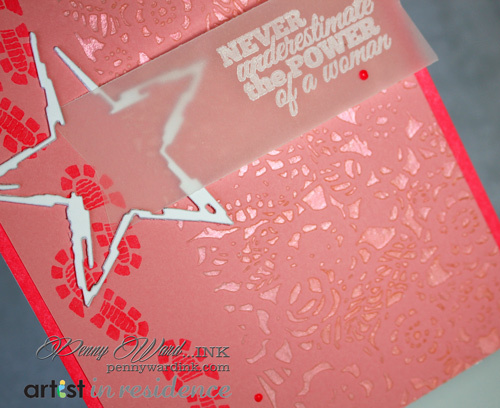 Stamp boot images with Radiant Neon Coral ink along the left edge. Adhere this panel to a card base formed from White cardstock cut at 4.25 x 11 inches, folded in half and inked on the long edges with Radiant Coral. 4. Die cut star from White cardstock two times. Stack and adhere together. Attach to card front. 5. Stamp sentiment using StazOn Cotton White onto vellum. Trim and notch ends, then slip through and under star embellishment. 6. Add irRESISTible Pico Neon Coral as shown.